"41HS3, Extra-46" by Timothy K. Perttula and Robert Z. Selden Jr.
DECORATION (INCLUDING MOTIF AND ELEMENTS WHEN APPARENT): The rim panel is divided into four sections by large cross-hatched bracket elements. Within each section is a large engraved nested triangle with a small central open circle and lower negative oval elements defined by excised brackets; the outer line of the nested triangles ends in hooked arms. These hooked arms almost touch the upper triangular zones, which also have negative ovals defined by excised brackets. Ripley Engraved, var. 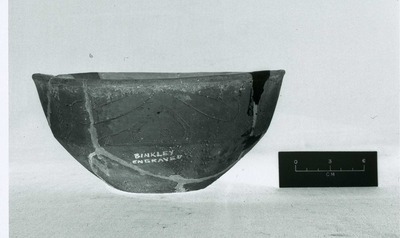 unspecified carinated bowl (Extra-46) from the H. R. Taylor site.